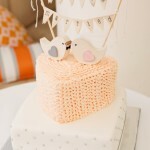 An incredibly sweet bride, a much-loved venue, and handmade paper art decorations everywhere! 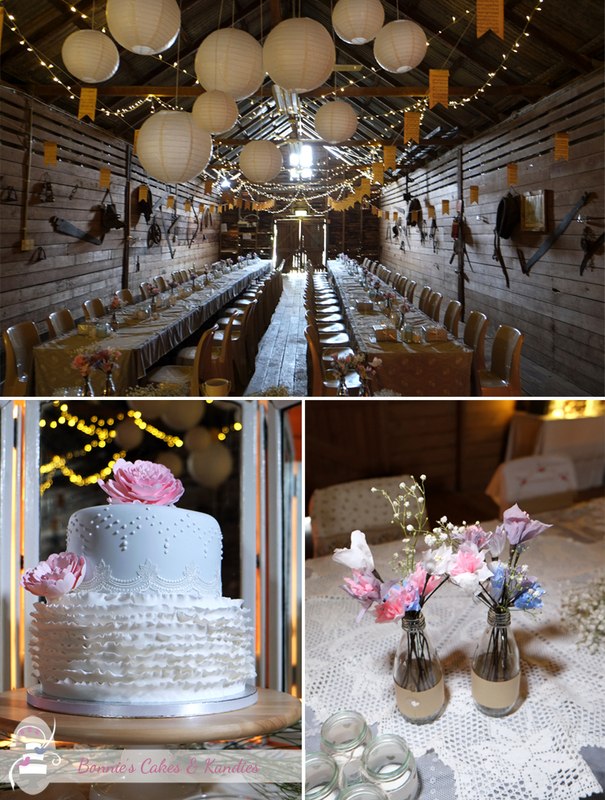 What a pleasure to be a part of this wedding, where thoughtful touches of vintage elegance complemented country styling to create a beautiful atmosphere, and I’m sure, a day that the happy couple and their guests will never forget! Today’s cake was delivered to the always charming Kenilworth Homestead. 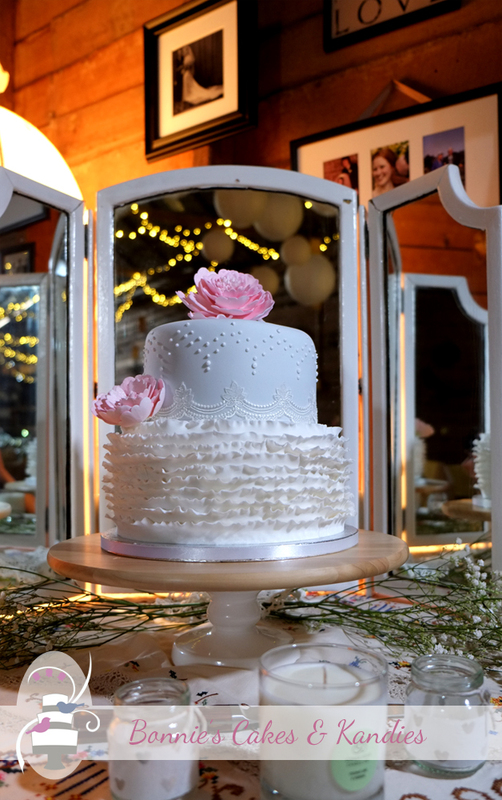 The cake was placed on a stand made especially for the day, and framed so beautifully by an old folding mirror, which served as the backdrop. 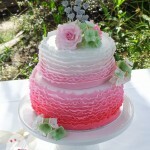 My lovely bride provided the lace, and I so enjoyed bringing her vision for the cake to life with delicate ruffles, piped embroidery, and pink icing peonies. SafeHands Catering provided finger food and a gourmet wedding buffet, with guests then treated to a choice of two different flavours of wedding cake for dessert. 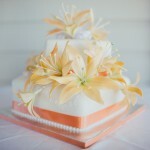 The top tier was made in lime and coconut cake, with dark chocolate macadamia mud cake as the bottom tier. Thank you to SafeHands Catering for permission to share their image below. Served up in bamboo boats with fresh cream, mint and fruit garnish – don’t the slices of cake look delicious! 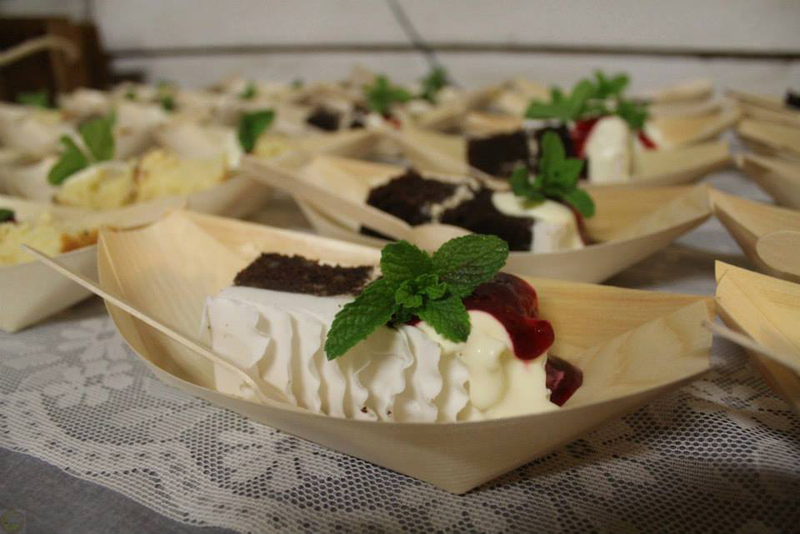 Two flavours of wedding cake by Bonnie’s Cakes & Kandies were served up by SafeHands Catering in bamboo boats with fresh cream, mint, and fruit garnish. Photo credit: SafeHands Catering. For more mouthwatering pictures and information on SafeHands Catering, see their website: www.safehandscatering.com and be sure to have a look at their gallery! I must also mention the beautiful paper art decorations by LenaLime. I can only imagine how many hours must have been spent handcrafting the masses of individual paper flowers and vintage music paper bunting which adorned the tables and hung from the ceilings. What a magical atmosphere for such a special day! Kenilworth Homestead barn decorated with handmade paper flowers and vintage music paper bunting by LenaLime. 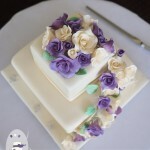 Wedding cake by Bonnie’s Cakes & Kandies. 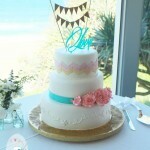 Thank you to the sweetest bride and her lucky groom for choosing Bonnie’s Cakes & Kandies as your wedding cake supplier. It was an absolute pleasure to be a part of your day, and I wish you nothing but bright, sunny days ahead! Congratulations and very best wishes to you both!